Take Exit 42A (114 East). 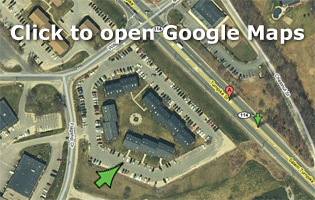 Follow 114 East for 2.6 miles, going through a total of 9 traffic lights while passing Merrimack College (5th light) and Stop & Shop (8th light) on the right. At the 9th light, take a right onto Willow St. and an immediate left into the parking lot with the brick buildings (The Willows Professional Park - South). Keeping the buildings on your left, go to the back of the complex and look for #857. Willows Associates is on the first floor, right-hand door. Take 125 East or 133 East to 114 East. Pass the Stop & Shop on your right. Take a right at the next light onto Willow St. and follow the directions as above. Follow 114 West into North Andover. At the first traffic light, take a left onto Willow St. and follow the directions as above. This large green arrow indicates the office entrance.